Using mice expressing green fluorescent protein (GFP) from a transgenic CD11c promoter we found that a controlled optic nerve crush (ONC) injury attracted GFPhi retinal myeloid cells to the dying retinal ganglion cells and their axons. However, the origin of these retinal myeloid cells was uncertain. 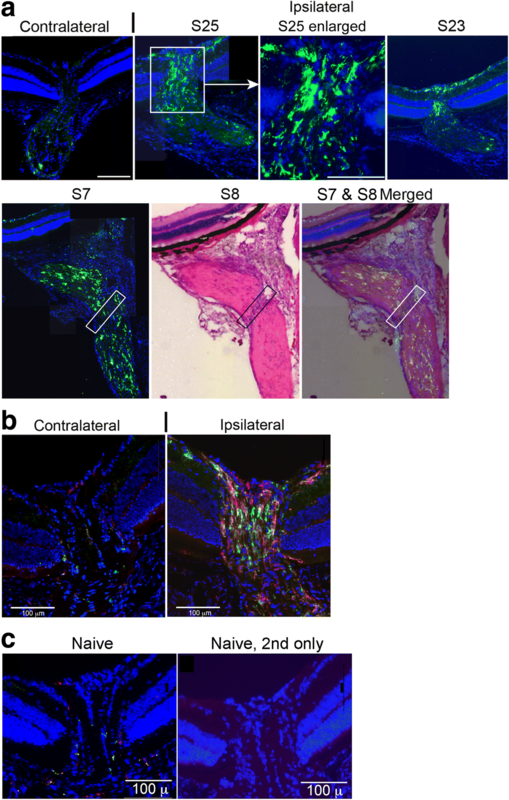 In this study we use transgenic mice in conjunction with ONC, partial and full optic nerve transection (ONT), and parabiosis to determine the origin of injury induced retinal myeloid cells. Analysis of parabiotic mice and fate mapping showed that responding retinal myeloid cells were not derived from circulating macrophages and that GFPhi myeloid cells could be derived from GFPlo microglia. Comparison of optic nerve to retina following an ONC showed a much greater concentration of GFPhi cells and GFPlo microglia in the optic nerve. Optic nerve injury also induced Ki67+ cells in the optic nerve but not in the retina. 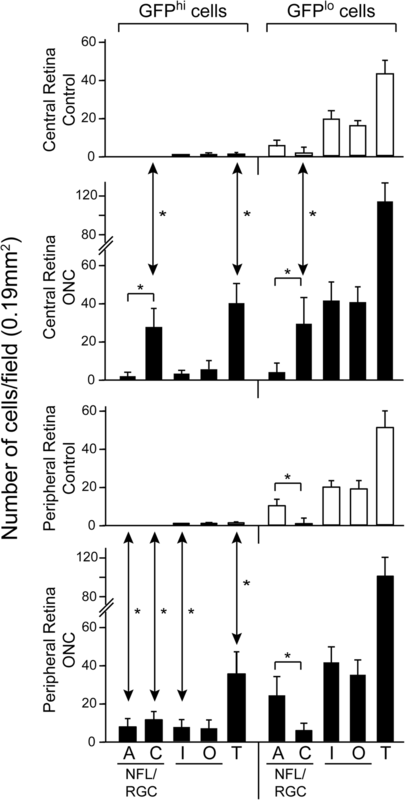 Comparison of the retinal myeloid cell response after full versus partial ONT revealed fewer GFPhi cells and GFPlo microglia in the retina following a full ONT despite it being a more severe injury, suggesting that full transection of the optic nerve can block the migration of responding myeloid cells to the retina. Our results suggest that the optic nerve can be a reservoir for activated microglia and other retinal myeloid cells in the retina following optic nerve injury. Microglia are the major population of immune cells in quiescent retina and are important for maintenance of retinal homeostasis . The microglia niche is filled by the initial seeding of CNS with yolk sac progenitors during development . Although microglia are widely reported to be the antigen presenting cells (APC) of the CNS, very few reports included definitive functional assays; i.e. antigen processing that supported generation of cognate peptides for presentation to naïve antigen-specific T cells [4, 47, 58]. Our experiments testing murine retinal microglia found that they did not fulfill these critical functional requirements for antigen presentation . Since dendritic cells are the classic “professional” APC and express CD11c, we tested the CD11cGFP reporter mice  in our search for retinal APC. GFP reporter expression in retina revealed a population of microglia-like cells (CD45medCD11bhiIba1+F4/80+Ly6CloCX3CR1hi) that expressed GFP (GFPhi cells) from the transgenic CD11c promoter [33, 62]. We found by in vitro and in vivo studies that GFP expression in these retinal cells correlated with APC function [17, 18, 46]. Our studies of the APC function of these GFPhi retinal myeloid cells in CD11cGFP reporter mice showed that an optic nerve crush (ONC) injury to the axons of retinal ganglion cells (RGC) generated large numbers of retinal GFPhi myeloid cells . These cells were then found to dominate the clearance of RGC/axon debris after an ONC . Recently we reported that the GFPhi myeloid cells in CD11cGFP mouse retina were major responders in the outer retina during cone photoreceptor degeneration in RPE65 knockout mice. The evidence suggested that they were an activated form of microglia , and no evidence of recruited myeloid cells was found in this degeneration model. Studies using radiation-bone marrow (BM) chimeric mice given a retinal injury after BM grafting showed that rapid recruitment of circulating BM-derived macrophages comprised the injury response . In the absence of injury, the retina was slowly repopulated with microglia-like macrophages derived from the donor BM . However, studies in brain using parabiosis in place of radiation-BM chimeras showed that circulating precursors of CNS myeloid cells were not recruited by injuries in the absence of the radiation chimerism protocol [1, 31]. Prior studies concerning the presence and origin of myeloid cells in the optic nerve, before and after injury to the optic nerve or retina, provided evidence that circulating macrophages were readily recruited into the optic nerve and optic nerve head (ONH) [26, 32]. Others suggested that the optic nerve could be a source of retinal myeloid cells [23, 26]. These differing results raised the possibility that microglia could traffic from optic nerve to retina but were complicated by the use of radiation-BM chimeras. The origin of the injury-induced GFPhi myeloid cells in CD11cGFP mouse retina was of interest, as they dominated the response in the retinal ganglion cell (RGC)/nerve fiber layer (NFL) post-ONC . In preliminary studies we found that the microglia in optic nerve responded vigorously to injury and rapidly repopulated following ablation, unlike the retina. To further explore the origin of the injury-induced retinal GFPhi myeloid cells in this reporter mouse strain, we examined the possibility that they originated from microglia in retina and optic nerve. Microglia proliferation has been reported in various CNS stresses and injuries [6, 16, 64], including retina following an optic nerve transection (ONT) . Evidence for production of microglia by local progenitors in brain  and retina  has been found, as well as migration from other regions contributing to accumulation at the site of injury [40, 57]. While acknowledging the observations that retinal microglial proliferation post-ablation may account for a major part of the retinal repopulation response [23, 24, 71], we found evidence that optic nerve was a source of retinal myeloid cells following optic nerve injury in an already fully-populated retina. Nomenclature and sources of the mice are listed in Table 1. CD11cGFP mice express eGFP as a chimeric cell membrane protein comprised of the diphtheria toxin receptor and GFP under control of a transgenic CD11c promoter . It is important to note that the transgenic CD11c promoter driving GFP expression is not the same as the endogenous CD11c promoter, and that expression of the endogenous CD11c protein in retinal myeloid cells does not correlate with expression of the GFP reporter in retina . CD11cGFP mice crossed with CX3CR1YFP-creER mice were also used to examine injury-induced transgenic GFP expression in microglia in combination with expression of other common markers of microglia including CD11b and/or F4/80. CD11cGFP mice were also crossed with the R161H mice that develop spontaneous autoimmune uveoretinitis [20, 21]. The retinal inflammation in CD11cGFP:R161H mice provided positive controls for Ki67 staining of proliferating immune cells in inflamed retina. Since CD4 T cell antigen recognition in the R161H T cells is B10.R3-restricted, breeding was done to generate these mice on the (B10.R3 x B6J)F1 background. Briefly, R161H mice on the B10.R3 background were mated with CD11cGFP mice (B6J background) to produce F1 offspring. F1 pups expressing the CD11cGFP transgene and the R161H T cell antigen receptor spontaneously developed autoimmune uveoretinitis. ACTbeGFP mice express GFP in many cells driven by a βactin promoter and were used to track donor cells in recipient mice in parabiosis experiments. CX3CR1YFP-creER mice were also crossed with floxed Tomato Red reporter mice (R26RFP) and CD11cGFP mice for fate mapping. Tamoxifen (Tam) was used to activate cre in cells expressing CX3CR1 promoted YFP-creER, inducing RFP expression in those cells. All mice were rd8-negative . Mice were reared under cyclic light in specific pathogen-free conditions. Mice were sacrificed by CO2 exposure. Fate mapping strategies from the Saban lab and others [15, 30, 50, 51] were adapted to examine the origins of the retinal GFPhi myeloid cells. The CX3CR1YFP-CreER:R26RFP mice were crossed with CD11cGFP mice for these experiments. Tam was given twice on alternate days at the 3 mg/dose as previously described  so that CX3CR1+ cells upregulated expression of RFP. At 70 days post-Tam, mice were given an optic nerve crush. Eight days later the mice were examined for induction of GFP-expression in the RFP+ retinal myeloid cells. To sever the optic nerve and preserve the ophthalmic artery and blood flow to the retina, an ONT was done one mm from the posterior pole. The optic nerve of the left eye was exposed using the same strategy used for the optic nerve crush . Once exposed, the nerve was cut using #15003–08 Vannas-Tubingen Straight Spring Scissors. The procedure was delicate but allowed the critical preservation of blood flow to the retina while cutting all or part of the nerve. An ONC was used in several experiments to reproducibly injure the optic nerve with very little risk to the ophthalmic artery and blood flow. This procedure used #2197E DSAEK forceps, not self-closing (Ambler Surgical), to limit severity of the crush [19, 33]. Approximately 50% of ganglion cells die via apoptosis by 15 days following this ONC procedure, reaching a stable plateau for at least 4 months. Its use was validated relative to the often-used #N7 Dumont self-closing forceps procedure as shown in Fig. 1. Mice were euthanized, perfused, and the retinas removed as described [19, 33, 46, 62]. Retinas were suspended in 0.5 mg/ml Liberase/TM (Roche) and 0.05% DNase in DPBS and gently dispersed by trituration. Fluorescent-labeled antibodies (BD Biosciences and eBioscience) and viability dye (eFluor 780 Fixable Viability Dye, eBioscience) were added to cell suspensions and incubated on ice for 30 min to assess CD45, CD11b and Ly6G. Samples containing GFP and YFP reporters were excited using a 488 nm laser and detected using 550/30 (YFP) and 510/21 (GFP) bandpass filters separated by a 525 nm longpass mirror . RFP was excited using a 561 nm laser and detected using a 585/15 filter set. Fluorescent proteins were compensated with single color and fluorescence minus one (FMO) controls. Data analysis was done with FlowJo (Tree Star) software. Data collected from a single retina comprised a single sample. Samples of optic nerve, 4–5 mm in length, were similarly prepared and analyzed as a single sample. Gating strategy for flow counting retina, brain, and optic nerve samples was based on selection of all CD45+ cells, viable CD45+ cells, doublet rejection by FSC-height vs FCS-area scatter analysis, followed by gating on CD45medCD11bhiLy6G− for mononuclear cells. Blood samples were stained with the appropriate antibodies, lysed in 0.17 M NH4Cl, washed and resuspended in DPBS with 2% fetal bovine serum and then analyzed with monocytes being identified as CD45+CD11b+Ly6G−. Retina flatmounts were prepared as previously described . Isolated retina was fixed in 4% paraformaldehyde (PFA) for 5–10 min at room temperature (RT). Retinas were washed with PBS, blocked with 10% normal donkey serum for 1 h, flattened by four radial relaxing cuts, and stained. Retinas were incubated with primary antibodies and washed 6 times in PBS. Secondary antibodies were incubated for 3 h, washed 6 times with PBS, and coverslipped. Samples were mounted with DAPI (Immu-Mount, Vectashield, Burlingame, CA) or Fluoromount-G (Southern Biotech, Birmingham, AL) for fluorescence microscopy. Mice were anesthetized with a solution of 50 mg/mL ketamine (Akorn, Lake Forest, IL) and 5 mg/ml xylazine (Lloyd Laboratories, Shenandoah, IA) using 2 μl/g mouse. Pupil dilation was done with 2.5 μl of (0.5%) tropicamide (Bausch and Lomb, Tampa FL) and (0.25%) proparacaine (Akorn) solution applied topically to the cornea. Corneal hydration was maintained by liberal application of Systane (Alcon, Fort Worth, TX) or GenTeal (Alcon). Retinal images were obtained using a Micron III retinal imaging microscope (Phoenix Research Laboratories, Pleasanton, CA). White light (brightfield) and fluorescence image were obtained. For GFP, a 469/35 nm band pass excitation filter and a 525/50 nm band pass emission filter were used. For Tomato Red and RFP the excitation filter was 562/40 nm and the emission filter was 624/40 nm. Eyes were preserved in Davidson fixative and paraffin embedded overnight. Six μm sections were made through the optic nerve, deparaffinized and stained with hematoxylin and eosin (H&E). For immunofluorescence on sections, mice were anesthetized and transcardially perfused with 4% paraformaldehyde. Eyes and optic nerves were collected and cryoprotected with 30% sucrose. The tissue was embedded in Tissue Tek OCT compound followed by freezing in an isopentane bath cooled by liquid nitrogen. To reduce non-specific binding, 10–40 μm thick sections were blocked with 10% normal donkey serum for 1 h followed by staining for CD11b (BDPharmingen), CD11c-GFP (Invitrogen), Ki67 (Abcam), SMI-31 (Covance) and IsolectinB4 (Invitrogen). Sections were incubated as described [54, 62] with antibodies overnight at 4 °C. After three rinses in PBS, appropriate secondary antibodies were applied (Alexa Fluor 350, 488 and 594; Molecular Probes, CA). The tissues were incubated at RT in the dark for 3 h and counterstained with DAPI. Primary antibody was omitted to confirm specificity. Fluorescence images were obtained using a confocal scanning laser microscope (Olympus Fluoview 1000) or a LEICA DM 4000B fluorescence microscope. B6J and ACTbGFP mice were surgically conjoined at three months of age using the procedure of Kamran et al. . From two to six months later, blood was taken from each parabiont to confirm successful parabiosis, followed by a unilateral ONC, or were untreated, to explore recruitment of GFP+ mononuclear cells into the B6J mice from the circulation by a retinal injury. At the specified times, the mice were perfused and separated for tissue harvest and analysis. RGC counts were done as previously reported . Injection of 4% Fluorogold (FG) into the superior colliculus was used to label the RGC for counting. FG was administered after the ONC, 4 days before retina harvest. Labeled soma were counted by fluorescence microscopy. Analysis was done by one-way ANOVA with Tukey HSD post-hoc analysis or by Kruskal-Wallis H test analysis. P value of < 0.05 was considered significant. All experiments conformed with the Association for Research in Vision and Ophthalmology Statement for the Use of Animals in Ophthalmic and Vision Research. Experimental procedures were approved by the University of Minnesota Institutional Animal Care and Use Committee. Studies of the origin and frequency of GFPhi cells in the retina of CD11cGFP mice after an ON injury required reproducible injuries. A well-controlled, limited ONC using DSAEK forceps  resulted in the stable loss of approximately 50% of the RGC, corresponding to loss of 25 × 103 RGC/retina (Fig. 1a), a small fraction of the 8 × 106 neurons/retina . A consistent feature of the early GFPhi cell response to this optic nerve injury was the accumulation of GFPhi myeloid cells around the optic disk detected by 6 days post-injury (Fig. 1b). Microglia and the GFPhi cells were readily distinguished by flow cytometry of retinas gated on CD45medCD11b+Ly6G− cells from CX3CR1YFP-creER:CD11cGFP double transgenic mice (Fig. 1c). The GFPhiYFPhi subset increased dramatically post-ONC, peaking between 7 and 13 days post-ONC, while the GFPloYFPhi microglia showed a smaller increase (Fig. 1d). By joining the circulations of two mice (parabiosis) in which one mouse carries readily detectable, labeled immune cells, it is possible to determine if those immune cells in tissues of the non-labeled mouse were derived from the circulation. Here, we used this approach to determine if ONC injury can stimulated the recruitment of circulating monocytes cells to the retina. Parabiotic pairs were made by joining wt B6J mice with ACTbeGFP mice (Fig. 2a). Establishment of parabiosis was verified by flow cytometry analysis of blood monocytes (CD45+CD11b+) for GFP from each parabiotic partner four to six months post-joining and from unpaired B6J and ACTbeGFP control mice (Fig. 2b). GFPhi monocytes were rare in the blood of normal B6J mice but dominant in ACTbeGFP mice (Fig. 2b, left). In contrast, blood from B6J x ACTbeGFP parabionts revealed similar levels of GFPhi and GFPlo monocytes in either partner (Fig. 2b, right). To confirm that mononuclear cells from an ACTbeGFP donor populating a B6J recipient could respond to stimulus, a needle stick injury was made in the brain of the B6J partner of a B6J x ACTbeGFP parabiotic pair. Fluorescence microscopy of the injury site showed it was heavily infiltrated by ACTbeGFP+ cells (data not shown). Flow cytometry of isolated retinas from unpaired control mice showed the background level of GFPhi cells in B6J mice to be very low (retina group 1), whereas control ACTbeGFP mice contained substantial numbers of GFPhi cells (retina group 2) (Fig. 2c, right). The ability of retinal myeloid cells to respond to an ONC injury was confirmed in the B6J mice (Fig. 2c, GFPlo cells in retina group 3 versus retina group 1). Following confirmation of successful parabiosis, myeloid cells in the retinas of the B6J partners in B6J x ACTbeGFP parabionts were analyzed. Very few GFPhi myeloid cells were found in retinas of uninjured B6J partners (retina group 4). 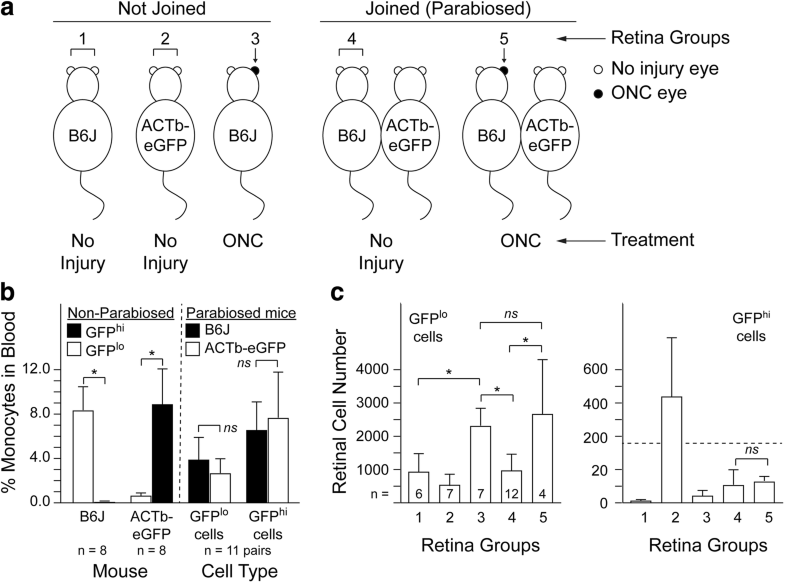 ONC to the B6J partners increased the total retinal myeloid cell numbers in the B6J partner mice to a similar level observed in unpaired B6J mice given an ONC (Fig. 2c, GFPlo cells, retina group 3 vs group 5). However, the number of GFPhi myeloid cells was not increased by ONC to one eye of the B6J partners (Fig. 2c, right, retina group 4 vs. group 5). The initial flow cytometry analysis of the B6J partner mice yielded very low numbers of GFPhi cells. 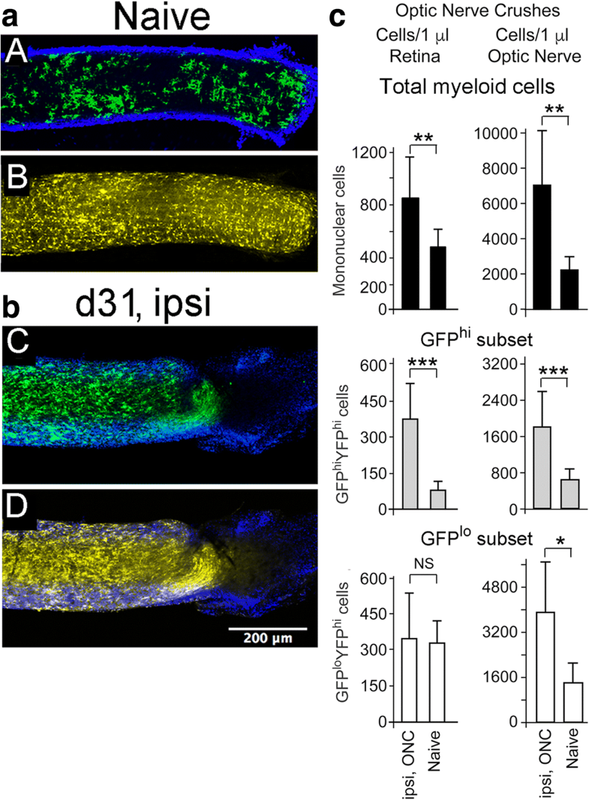 To verify this low frequency of GFPhi cells in the B6J partners, three additional retinas from uninjured B6J partners and two additional retinas from ONC injured B6J partners were analyzed by fluorescence microscopy for GFP+ cells. Uninjured retinas from the B6J partners contained a total of one to three GFP+ myeloid while the injured retinas contained three and five GFP+ myeloid (data not shown), thus confirming the low GFPhi cell number observed by flow cytometry. Together, this data suggests that while the blood of the B6J partners was well-populated with ACTbeGFP+ cells, they did not contribute to the large increase in myeloid cells in B6J retinas post-ONC. If the myeloid cells responding to an ONC injury were not recruited from the circulation, we asked if they had a local origin. In particular, did they arise from the resident microglia. CX3CR1YFP-CreER:R26RFP mice, with and without the CD11cGFP transgene, were systemically treated with Tam to induce expression of the floxed RFP reporter in all CX3CR1+ cells. RFP was highly expressed in circulating mononuclear cells 3 days post-Tam and in retinal microglia (Fig. 3a & b). By 47 days the blood was nearly cleared of RFPhi cells (Fig. 3a), but retinas remained highly labeled at 70 days (Fig. 3b). An ONC was done at 70 days post-Tam followed by harvest at 78 days for flow cytometry and retinal flatmounts. The numbers of CD11b+CX3CR1+RFP+ cells with and without the CD11cGFP reporter in the injured, ipsilateral retinas were indistinguishable (Fig. 3c & d), showing that the increase in myeloid cells in ipsilateral retinas was of the same magnitude in mice with or without the CD11cGFP reporter. However, much of the increase in post-ONC myeloid cells was found to be due to the increase in the GFPhi population, which was both YFP+ and RFP+ (Fig. 3d, right panels). Since recruited cells would have been RFP−, we concluded that GFP expression from the CD11cGFP promoter/reporter marked the responding subpopulation of RFP+ microglia. No evidence of recruited cells (RFPloGFPhi) was found. A flatmount of a Tam-induced, ONC-injured retina from an RFP+ reporter mouse showed that GFPhi microglia were also RFPhi (Fig. 3e). In preliminary studies we observed a vigorous injury response of GFPhi microglia in the optic nerve post-ONC (Additional file 1: Figure S1). This observation raised the possibility that this response could contribute to the retinal ONC response. If the damaged axons in the optic nerve acted as an attractant and/or path for microglial migration into retina, then a full transection injury to the RGC axons in the optic nerve, while sparing the ophthalmic artery, might reduce the overall response in the retina by blocking the pathway of microglia migration from the optic nerve into the retina. Conversely, a partial ONT that also spared the ophthalmic artery might support a strong retinal response by leaving part of the pathway intact for migration. ONT procedures led to loss of RGC, but the retina was otherwise intact (Additional file 2: Figure S2b). Accidental transection of the ophthalmic artery during the optic nerve transection surgery rapidly produced a catastrophic, hypoxic injury to the retina (Additional file 2: Figure S2b); these samples were omitted. An ONT that spared the ophthalmic artery was found to be a potent stimulus for a microglial response in the retina (Additional file 2: Figure S2d). Accordingly, we sought to determine if a full vs partial ONT could be used to test our hypothesis if the ophthalmic artery was intact. To assess the potential contributions of the optic nerve to the retinal microglia response due to partial cut vs full cut ONT, it was helpful to determine the extent of the ONT prior to harvesting the retina for analysis. We previously showed that the GFPhi cells preferentially associated with the RGC axons after an ONC, generating a radial pattern in fluorescence microscopy and fundus imaging [19, 33]. Due to the topography of the RGC axons projecting into the optic nerve during development, we predicted that a partial transection of the optic nerve would lead to a limited sectoral association of GFPhi microglia on the axons that were severed in the ON, while a full transection would give a 360° pattern of GFPhi microglia. Conversely, an ONC would yield no specific sectoral pattern. These predictions were verified by fundus imaging (Fig. 4a). Very few GFPhi microglia were found in normal CD11cGFP retina (panel A), but were prominent throughout the fundus 7 days post-ONC with no discernable sectoral distribution (panel D). Cuts intended to result in a full transection gave the fundus images in panels (B1 to C2), where the GFPhi microglia are found in all sectors. Fundus imaging of attempts to make partial ONTs on the temporal side of the optic nerve led to a reproducible, sectoral appearance of GFPhi cells in approximately one-third to one-half of the retina (panels E to F3). To validate the use of fundus imaging to detect axon topography, an ipsilateral optic nerve from a mouse 35 days post-partial ONT was severed flush with the back of the globe. The other end was cut free at the chiasm. The nerve was prepared for cross-sections and stained for SMI-31 to detect axons, and for isolectin B4 to detect the ophthalmic artery, providing orientation. The sectoral distribution of GFPhi microglia seen in retina was recapitulated in the optic nerve receiving a partial transection (Fig. 4b). The transection procedure cuts from the temporal side behind the globe so that the ophthalmic artery was on the opposite, nasal side of the nerve. Accordingly, the SMI-31 staining (red) of intact fibers was concentrated on the nasal side of the nerve, while GFPhi cells were concentrated on the temporal side, where the SMI-31 stainable axons have been substantially cleared. Controls showed the density of CD11b+ and GFPhi cells in normal and 10 days post-ONC controls. Close examination of naive retinal flatmounts found few YFPhi microglia near the optic nerve head in a confocal stack containing only the NFL and RGC layers (Fig. 5a). The microglia marked by arrows in panel A were enlarged to show that they were YFPhiGFPlo and YFPhiGFPhi, respectively panel A2. Many more microglia were found in the underlying inner plexiform layer (IPL) (Additional file 3: Figure S3). The findings seen in the fluorescence fundus imaging were further recapitulated in retinal flat mounts. GFPhi cells were found in the early stages of aligning with the nerve fibers in the ipsilateral retina at 6 days post-full ONT (Fig. 5b), while there was minimal change in GFPhi cells in the contralateral retina (Additional file 4: Figure S4a). By 10 days post-partial ONT there was pronounced association of GFPhi cells with the nerve fibers near the ONH on the temporal half of the retina (Fig. 5b). GFPhi cells also appeared in peripheral retina along the nerve fibers (Additional file 5: Figure S5). The background level of GFPhi cells in the contralateral retina appeared to have increased (Fig. 5b), but may represent intraretinal migration since the total number of cells/contralateral retina were minimally elevated, and association with the NFL was minimal. At 21 days post-partial ONT an intense interaction of GFPhi microglia with RGC axons was seen in the ipsilateral retina, in both central and peripheral retina (Fig. 5c). GFPhi microglia appeared as green and yellow cells due to CD11b co-staining using a red fluor. In the contralateral retina, an increase in GFPhi microglia in the peripapillary region was seen (Additional file 4: Figure S4b) compared to naïve retina, and 6 and 10 days post-ONT. The important difference was that the GFPhi microglia in contralateral central retina were not closely associated with axons but were ramified (Additional file 4: Figure S4b). 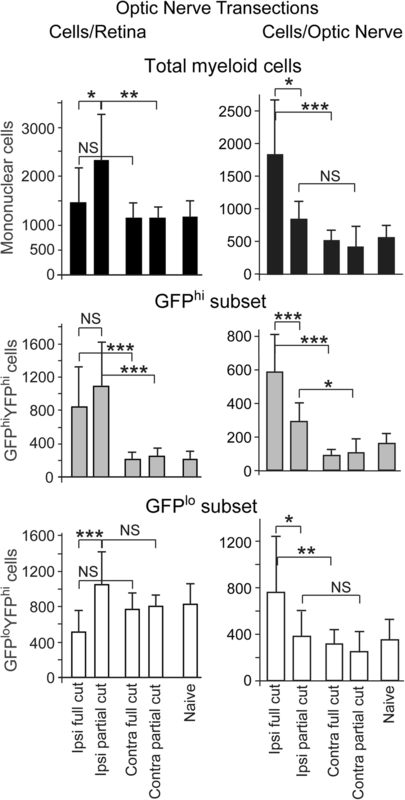 Similar differences were found in the interactions between GFPhi microglia in the ipsi- versus contralateral peripheral retina. The number of GFPhi cells in peripapillary retina after a near-complete ONT declined substantially by 31 days (Fig. 5d), and the staining for RGC axons with anti-β3 tubulin was sparse compared to normal retina, and limited to the lower-left quadrant, consistent with the topography of a substantial ONT. Although flow cytometry measurements of cell number in the retina show differences in the overall magnitude of the responses to optic nerve injury, and photomicrographs of flatmounts show direct evidence of the interactions between the myeloid cells and injured neurons, counting cells can show changes in specific sites. Retinal flatmounts of naive and day 10 post-ONC retinas were made. In addition to counting the IPL and OPL which contain significant populations of microglia in control and injured retina, the NFL/RGC was examined for GFPhi and GFPlo microglia in two configurations. Each cell was examined for GFP expression, and for its association with nerve fibers or RGC soma, whether adjacent to the fibers or soma (Additional file 6: Figure S6a), or in direct contact (Additional file 6: Figure S6b). Care was taken to avoid contaminating the NFL/RGC counts with cells in the IPL, as the IPL is always well-populated with microglia. Eight areas of each retina were counted (Additional file 6: Figure S6c); the results of the four central areas were combined, according to the layers and interactions in the NFL/RGC, and whether GFPhi or GFPlo, as were those of the four peripheral areas. The largest differences between counts of injured and control retina were the GFPhi and GFPlo cells found in direct contact in the central NFL/RGC (Fig. 6). This was consistent with the results seen on days 6 through 21 post-injury shown in Fig. 5. In peripheral retina the GFPhi cells were elevated in every category post-ONC. GFPlo cells in the IPL and OPL essentially doubled in both central and peripheral retina post-ONC. The same nerve fibers that attracted little myeloid cell presence in the naïve retina were densely surrounded by GFPlo microglia in the naive optic nerve, which was also well-populated with GFPhi microglia (Fig. 7a). At 31 days post-ONC the optic nerve remained highly populated with GFPhi and GFPlo microglia (Fig. 7b). Very few GFPhi or GFPlo microglia were found in the optic nerve sheath. Analysis of the myeloid cells in the optic nerve and its injury response was compared to that of the retina. The average volume of an isolated optic nerve based on a diameter of 249 ± 43 μm and a length of about 5 mm from the eye to the optic chiasm was approximately 0.24 mm3, far less than the 2.73 mm3 volume of a typical single retina. To compensate for the differences in volume of the optic nerve compared to retina, the assays were expressed as the number of myeloid cells/1 μl of tissue. The recovery of total CD45medCD11bhi cells from naive optic nerve was much greater, approximately 5-fold, than that from naive retina on a volume basis, approximately 2.2 × 103 cells/mm3 for the optic nerve compared to 0.48 × 103/mm3 for the retina. The density of GFPlo microglia in naive optic nerve was several fold higher than in retina, and this difference was magnified 10 days post-ONC (Fig. 7c). GFPhi cells were also much higher in naive optic nerve, and in post-ONC samples. The differences between the GFPlo and GFPhi populations of microglia in naïve tissue were similarly pronounced. An important difference between retina and optic nerve post-ONC is that the GFPlo microglia in retina were not significantly increased after the ONC, while the difference in the optic nerve pre- vs post-ONC was substantial (Fig. 7c, bottom panels). The impact of partial and full ONT injuries on the recruitment of GFPhi myeloid cells and GFPlo microglia into the retina was done by comparing the results of the transections on day 11 post-injury in CX3CR1YFP:CD11cGFP mice. Retina and optic nerve were assessed by flow cytometry. Based on the fundus photos of retinas acquired from live mice at days 9 to day 11 post-ONT, the retinas and nerves were assigned to the full or partial cut categories as demonstrated by the samples shown in Fig. 4. This grouping revealed differences in the outcomes of full- versus partial-ONT (Fig. 8). Full thickness ONT limited the magnitude of the total retinal mononuclear cell response in comparison to partial ONT; the GFPhi cells in retina were elevated while the GFPlo microglia numbers were lower than in the partial ONT. While the full ONT is the more severe injury, and accompanied by the loss of virtually all RGC in retina, the full ONT gave an attenuated GFPhi microglia response relative to a partial ONT. Since the GFPhi cells were not significantly lower in full ONT retinas compared to partial ONTs, it appears that a greater fraction of retinal microglia converted to GFPhi. Since retinal microglia were not replaced by migrants from the full cut optic nerve, their numbers were significantly lower than in the retina of a partial ONT (Fig. 8). The opposite results were found in optic nerve, where the full ONT samples were elevated compared to partial ONT samples. The optic nerve head was nearly devoid of GFPhi cells in naïve (Fig. 9c) and post-ONT contralateral retinas (Fig. 9a & b). In contrast, the ipsilateral optic nerve head was heavily populated with GFPhi microglia at 11 days post-partial ONT (Fig. 9a, S25). S23 showed the extensive infiltration of GFPhi microglia into the RGC/NFL around the optic nerve head that was prominent in views of flatmounts post-ON injury. GFPhi cells were found on both sides of the partial cut site in the nerve (S7/S8). The ipsilateral ONH following a full ONT was heavily populated with GFPhi and GFPlo microglia (Fig. 9b). Careful examination of retinal flatmounts from CD11cGFP mice post-ONC or ONT at 2 or 6 days post-injury found very few Ki67+ cells. Quantitation of Ki67+ cells/retina was problematic in that setting up a counting grid of 8 regions, each 0.19 mm2, with 2 regions/petal, led to counts of 0 cells/retina. However, searching the entire retina for Ki67+ cells yielded approximately 1–3 small clusters or single cells/retina (Fig. 10a); some were GFP+, and some were CD11b+ (not shown). By comparison, many Ki67+ cells were found in retina using an inflammatory disease model, experimental autoimmune uveitis, that attracted large numbers of immune cells into retina (Fig. 10c). If the retina was not a source of new microglia, we asked if the optic nerve supported generation of the injury response. Unlike our observations in retina, Ki67+ cells with and without CD11b expression were readily found in the optic nerve after injury (Fig. 10b). Counts of Ki67+ cells in the optic nerve were made at 1, 4, and 7 days post-ONC (Fig. 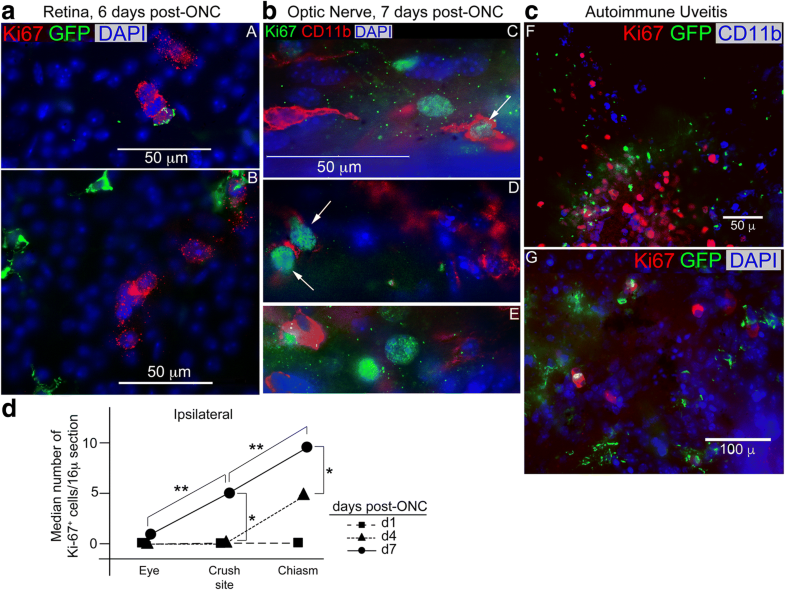 10d) revealed substantial numbers of Ki67+ cells by 7 days post-ONC in the ipsilateral optic nerve. In contrast, very few Ki67+ cells were observed in the contralateral nerve (data not shown). The vigorous GFPhi and GFPlo microglia response in the optic nerve was well-placed to contribute to the cellular response found in retina via migration from the nerve into the retina. These results indicate that the higher number of myeloid cells, and especially GFPhi microglia, in the retina after an ONC or partial ONT are not solely due to retinal microglial proliferation and activation in retina, but also represent migration from the nerve into the retina. It has long been observed that injury of retinal ganglion cells leads to a response by innate immune cells, particularly retinal microglia [19, 26, 33, 37, 38, 65, 68], and that RGC apoptosis can result from even modest injury [2, 5, 10, 11, 41]. There is a substantial body of literature in which crush injuries or transection of the optic nerve has been used to model glaucoma, traumatic optic neuropathy, and CNS nerve regeneration [3, 11, 37, 39, 41, 48, 56]. Many of these studies have shown microglia to be associated with survival or clearance of injured axons [42, 43]. However, the precise mechanisms by which microglia contribute to axon survival/clearance and their role in neural modeling and regeneration are still a matter of study. 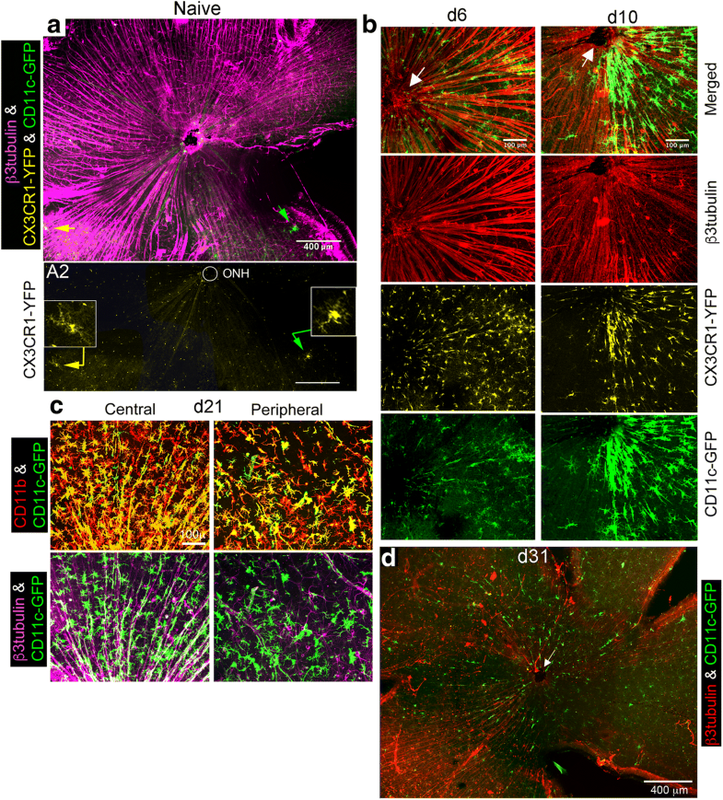 Using the CD11cGFP mouse we described a microglia-like population of cells uniquely identified by their expression of GFP in the retina after optic nerve injury that were distinct in response and function from other microglia. They differed in that they could act as dendritic cells, had a more dynamic response to injury, and were closely associated or in contact with the actual cells damaged by injury to the retina [18, 19, 33, 46]. Because of these unique characteristics, we sought to clarify the role and origin of these retinal GFPhi myeloid cells. In this study we show that these cells were not derived from circulating macrophages but rather were generated from retinal GFPlo microglia and augmented by microglial proliferation in the optic nerve. Studies on the origin(s) of innate immune cells in the nervous tissue following injury have been both limited and complicated by the models used to examine the issue. Many studies have been done using radiation bone marrow chimeras. They showed there was a gradual replacement of myeloid cells in neural parenchyma by circulating macrophages. Other studies approached this issue by largely ablating resident microglia and examining their replacements. Both of these strategies tend to create niches that are biased towards the most rapid replacement and may recruit circulating macrophages. Indeed, with the ablation studies it has been noted that key growth and maintenance factors such as IL-34 and CSF-1 are produced, leading to the stimulation of CD115+ myeloid cell replacements to fill the niche. Conversely, parabiotic studies on the origins of myeloid cells in the brain following injury demonstrated that few responding cells were derived from the circulating macrophages [1, 31]. Since parabiotic studies can avoid the issue of artificially created, empty niches we found it useful in identifying the origin of retinal myeloid cells responding to injury or loss of axons. Similar to the results found in the brains of parabiosed mice, our results demonstrated that increased numbers of retinal myeloid cells after injury was not the result of cells being recruited from the circulation. 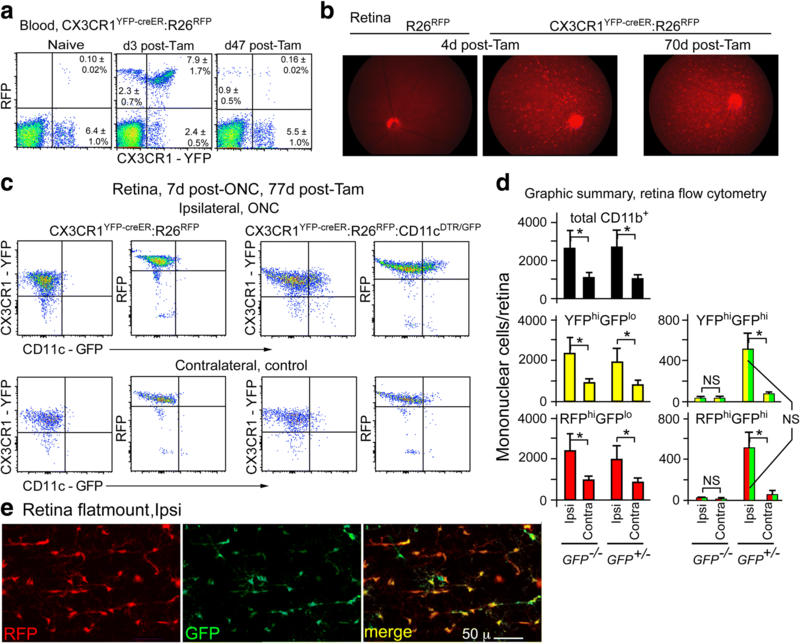 Since the enhanced appearance of myeloid cells in the retina after injury is not from a circulating source, it was logical to ask whether the GFPhi cells in the retinas of CD11cGFP mice after ONC injury were derived from the resident GFPlo microglia. Our fate mapping experiments clearly demonstrated that the GFPhi cells were indeed derived from GFPlo microglia. Although referred to as GFPhi retinal myeloid cells in this study, these cells can be thought of as GFPhi microglia consistent with our previous studies showing these cells were CD45medCD11bhiCX3CR1hiLy6G−Iba1+F4/80+Ly6Clo . If the development of GFPhi retinal myeloid cells after injury was from the transition of GFPlo retinal microglia, then it would be expected that the number of GFPlo microglia in the retina after ONC injury would concomitantly decrease. However, the fact that we have consistently observed steady or transiently increased GFPlo microglia numbers in the retina after ONC lead us to consider adjacent neural tissue as a source of these microglia. Since there are substantial numbers of microglia immediately underneath the NFL/RGC in the inner plexiform layer in naïve mice it could be expected that they could simply move up into the NFL/RGC following ONC. However, the course of the microglia response to an ONC begins with their appearance around the optic disk followed by a radial expansion through the peripheral retina. Interestingly, the optic nerve head itself in naïve mice has few microglia suggesting it is not the source of the responding GFPhi and GFPlo cells. This lead us to investigate whether the optic nerve could be a source of responding microglia. We hypothesized that if the optic nerve was responsible for generating responsive microglia that migrate into retina, then transection of the optic nerve close to the posterior pole, while sparing the artery, would limit access of optic nerve microglia to the retina. If this was the case, then a partial nerve transection should permit microglia access to the retina, but a full transection would block access to retina. Because transections were made from the temporal side, both the sheath and the nerve could be cut without damaging the artery. To facilitate the distinction between full and partial transections so that we could group the experimental mice accordingly, we took advantage of the topographic distribution of RGC axons in the proximal end of the optic nerve as described by others [34, 52], and the association of GFPhi cells with injured nerve fibers in the retina. This provided us with a straight-forward fluorescence fundus imaging strategy which readily distinguished between partial and full transections. Fundus imaging of the optic nerve head and retina in CD11cGFP mice showed that the area around the optic nerve head was highly populated with GFPhi cells after an optic nerve injury, consistent with the potential for responding microglia to migrate along damaged nerve fibers in the optic nerve into the retina, contributing to the increase in retinal myeloid cells after injury. Except for the expected loss of RGC and their axons, the retinas were intact for the duration of the experiment. With respect to the loss of RGC and clearance of degenerating axons in the retina, the potency of the injury stimulus in the retina following a full ONT is more severe than our ONC protocol, since a full ONT severs all of the RGC axons in the optic nerve whereas an ONC leaves approximately 50% of the axons and the corresponding RGC to survive indefinitely . Partial ONTs were also done to provide the essential control. Confocal studies of retinal flatmounts post-ONT showed GFPhi cells associated with nerve fibers and RGC in the expected topography. Flow cytometry of the retina after a full ONT versus a partial ONT showed that the microglia response in the retina differed. Despite the more severe injury to the RGC axons and subsequent apoptosis of the RGC in a full ONT, fewer total retinal microglia were found at 11 days post-full ONT compared to a partial ONT. Much of that difference in total microglia/retina was due to finding fewer GFPlo microglia in retina after a full cut compared to a partial cut. Conversion of microglia to GFPhi microglia depleted the GFPlo microglia which could not be sustained by influx from the optic nerve due to the full cut ONT. Conversely, the total number of GFPhi cells/retina was not significantly different between a full and partial transection. Closer examination of the data shows that a greater proportion of GFPhi cells was generated from their retinal microglial origin in full transections; i.e. an average of 825 GFPhi cells and 500 microglia following a full cut vs an average of 1100 GFPhi cells and 1050 GFPlo cells in the partial cut. The partial ONT led to a response that was similar in magnitude and composition to an ONC. Analysis of the myeloid cell response in optic nerve showed differences from retina in quiescent and injured samples. The full transection gave significantly higher numbers of GFPhi, GFPlo, and total microglia in the nerve than found after partial transection. On the basis of cell number/unit volume the magnitude of the responses in the optic nerve was substantially higher than in retina given that the volume of the optic nerve is 10-fold less than that of the retina. The decreased response found in the GFPlo population in retinas challenged by a full ONT is consistent with our hypothesis in that full transection may block migration of microglia from the optic nerve to the retina. Given the evidence that GFPhi cells were derived from the GFPlo microglia, we would predict a decrease in total mononuclear cells as a result. The difference between the retina and optic nerve response to an ONC was clear in the CX3CR1YFP+ microglia, which expanded in the optic nerve, but showed little difference in the retina. Despite the strong responses in GFPlo and GFPhi cells in the optic nerve post-full ONT, these responses are not reflected in the retina, whereas a partial transection led to a stronger response in retina. The results are consistent with the ability of the microglia in the optic nerve to proliferate, yielding both GFPlo and GFPhi cells consistent with the degree of injury. We did not find myeloid cells that were CD11b+ or CX3CR1YFP+ or CD11cGFP+ in the sheath. Instead, they were found in the parenchyma of the nerve. The sheath did not appear to be a significant conduit for macrophage migration, leaving the axons and their support tissue in the nerve as a pathway from nerve to retina. Why the retina was less able than the optic nerve to generate more microglia is uncertain, but in preliminary results, we found that repopulation after ablation of retinal microglia required far more time than did repopulation in the optic nerve after ablation of optic nerve microglia. Those results are consistent with differences between retina and optic nerve in non-microglial local progenitors, but we do not have such evidence to date. Other studies have reported significant numbers of proliferating microglia and/or myeloid cells in retina following an ONT or retinal degeneration, often based on BrdU labeling [65, 66, 69, 70]. If so, this would provide a source that would be expected to diminish the role of microglia entering retina from the optic nerve. The number and location of BrdU labeled cells remains a question for us; we and others have encountered concerns for label spreading into other cells . As a result, we have used antibodies to Ki67 to assess proliferation of myeloid cells in retina and optic nerve. Although we found many Ki67+ cells in the injured optic nerve, we found very few in retina post-optic nerve injury. To establish confidence in our Ki67 results, we included our control findings in retinal wholemounts post-ONC, compared to autoimmune retinitis. Ki67+ cells were numerous in inflamed retina, even at the very early stage of disease shown here. In unpublished results, we depleted host microglia by use of radiation bone marrow chimeras and found many Ki67+CD11b+ donor-derived macrophages in retina as it repopulated. These results suggested that our staining protocol was working but that recruited cells had much more proliferative potential. As a result, we have some confidence in our application of the Ki67 staining technique, but have not found results comparable to some other published reports, as noted above. There are many reports of proliferating microglia in brain, but our preliminary ablation results indicate that brain and retina may not be equivalent in this regard. Another potential source of retinal macrophages post-injury is recruitment from the circulation, and an intact blood-retinal barrier may reduce recruitment into and then through an injured optic nerve to the retina [13, 22]. Our parabiosis experiment showed that recruitment from the circulation was not a factor, in the case of optic nerve injury. However, the significance of this concern clearly applies to other injuries as shown from the results of Wong et al. who observed proliferation of infiltrating monocytes following RPE injury . Since the optic nerve sheath did not appear to be a pathway to the retina, microglia may instead respond to chemotactic signals from astrocytes, and move along the axons, whether injured or not. Astrocytes bundle the axons as they enter the optic nerve head and influence the topography of RGC axon development and their path into the nerve [12, 55, 59]. Perhaps astrocyte processes provide scaffolding for microglia migration. Astrocytes are known to produce pro-inflammatory molecules and interact with microglia , and inhibition of astrocyte reactivity can have an adverse effect on function post-ONC . Oligodendrocytes myelinating the mouse ON participate in the responses of microglia and astrocytes to damage in the optic nerve . Their role in vectoral microglia migration through the optic nerve injury model is uncertain. In any case, a full ONT would leave no path, with the cut site as a barrier to migration. Microglia on the proximal side of the cut site could still migrate into retina and associate directly with injured axons. We found that the proximal end of a full cut optic nerve was devoid of SMI-31-staining material, astrocytes (not shown) and microglia. We suggest that the microglia cleared axon debris and moved into the retina. We thank Dr. Robert Nickells, Ph.D., Department of Ophthalmology and Visual Sciences, University of Wisconsin, and Dr. Markus Kuehn, Department of Ophthalmology and Visual Sciences, University of Iowa, for critiques of the manuscript. We thank Md. Abedin for excellent technical assistance. This study was supported by the Minnesota Lions Eye Research Fund, Research to Prevent Blindness, the Wallin Neuroscience Discovery Fund (DSG), NIH/NationaI Eye Institute grants R01 EY021003 (DSG) and R01 EY025209 (DSG), and NIH/National Institute on Aging grant R01 AG056976 (LL). Data are available on request. Contact corresponding author. NDH-planned and conducted experiments, analyzed data; MJP-conducted experiments, analyzed data; HR-conducted experiments, analyzed data; SWM-conducted experiments, analyzed data, edited manuscript; ALG-planned and conducted experiments; LL-designed experiments, analyzed data, edited manuscript; DSG conception and design, data analysis, wrote manuscript, edited manuscript. All animal experiments were performed in accordance with the Association for Research in Vision and Ophthalmology (ARVO) Statement for the Use of Animals in Ophthalmic and Vision Research. The protocol was approved by the University of Minnesota Institutional Animal Care and Use Committee (IACUC).